Faced with a federal forfeiture threat against their property, the landlords of Harborside Health Center's San Jose branch are trying to dislodge the enterprise. Via Courthouse News Service today: "'Concourse [Business Center, LLC] has had ongoing discussions with Harborside in an attempt to agree on a date by which Harborside would vacate the property,' Concourse claims. 'The parties have been unable to reach such an agreement and Harborside has also failed and refused to cease cannabis sales at the property.'" About 30 percent of Americans believe a nuclear weapon will be detonated in a U.S. city in their lifetime. Hopefully such unfathomable horror is a little less probable now that the Canadian version of the border patrol is prioritizing the interception of exported fissile material and stolen cars over finding a relatively harmless weed. We applaud our northern neighbors' decision, and marvel that national priorities could be so misplaced to begin with. Pot, Psychosis and "The Woman in 606"
Everyone read Christopher Frizzelle's brutal, haunting new piece in Seattle alt-weekly The Stranger, called “The Woman in 606”. It's about psychosis, loneliness, urban living, Seattle, depression, suicide, pot, and sexual abuse, and it'll force a reassessment of the crazies in your life that you try to avoid. Maybe go back to the Marina then, snitches. A San Francisco Planning Commission hearing to permit a new pot club in the Mission District highlighted some pretty shameful opinions of Mission NIMBYs last week. The “Morado Collective” at 2520 Mission St. would interfere with some local land owners' plans to "gentrify" the Mission, neighbors wrote. These landlords have since snitched on the proposed club to U.S. Attorney Melinda Haag, in the hopes of stopping the dispensary. That's some despicable behavior, and they should be called to the mat on it, we feel. One of the nation's most popular new marijuana book authors, Doug Fine, swings into the Bay Area this week for a series of book readings, signings and fundraisers to drum up publicity for Too High to Fail; maybe go check him out. Talk show host and noted legalization proponent Bill Maher penned a fawning review of Fine's book in the New York Times Sunday Book Review. That Maher plug has become the diamond in a jeweled crown of publicity for the Penguin title. Fine has done Conan, and frickin' Michael Pollan tweeted him up, calling Too High a “very important book”. “That's like a hero acknowledging my existence,” Fine said. The City of Los Angeles is making good on its attempt to ban an estimated 1,000 storefront dispensaries in city limits, Los Angeles Times' Kate Linthicum blogs today. On Tuesday, the city began sending out letters ordering weed storefronts to close by Sept. 6. Operators, however, remain defiant. "I'm not shutting down," Greater Los Angeles Collectives Alliance head Yamileth Bolanos told Linthicum. The group is helping run a signature-gathering effort to send the ban to the ballot. Medical marijuana dispensary supporters have thirty days from the publication of the ban to file the requisite number of signatures with the city clerk. Americans for Safe Access leader Don Duncan estimates the coalition will need about 28,000 signatures, which would be 10 percent of the total votes cast for all candidates for Mayor in the previous election. "Voters would support a referendum," Duncan told Legalization Nation. "They just want to see it regulated properly." Is the mere image of the seven-bladed cannabis leaf enough to corrupt young minds? On Facebook it is. JustSayNow.com — a group working to "make sure marijuana reform isn't neglected this election cycle" — tried to launch ads last week on Facebook.com for its new campaign "Don't Forget Marijuana". 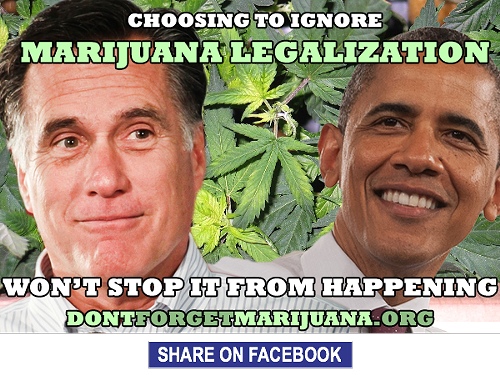 "The ads featured President Obama, Mitt Romney and images of marijuana [leaves] alongside a message encouraging people to join the campaign," they wrote in an online statement. "Facebook rejected the ads on the ridiculous grounds that the simple act of showing a marijuana leaf promotes drug use," JustSayNow stated. So they're asking folks to sign their petition at progressive website Firedoglake.com to protest Facebook's censorship of the "marijuana reform movement's voice." Backed by the likes of Progressive insurance founder Peter Lewis, the proponents of Washington state's pot regulation Initiative 502 are ramping up a $1 million advertising campaign this week using a soccer mom-centric first ad that premiered Wednesday in Seattle and will run until August 25.